Things could certainly change, but if this remains accurate we’re in for a great week at camp! Good Morning from the teacher’s cabin! It’s about 6:30 a.m. and this teacher is enjoying some quiet time before the chaos begins. We have breakfast at 8:00 this morning and then the kids will be off to get ready for their first “big” hike. While they’re away, I’ll be writing my blog post about the bus ride (did you know that children moo?) It will be posted here: Miss McMillan Goes to Camp. Note to self: Ask better questions! Judging by all of the smiles and laughter (and the amount of spaghetti and breadsticks consumed), I think their day was oh so much better than “good”. 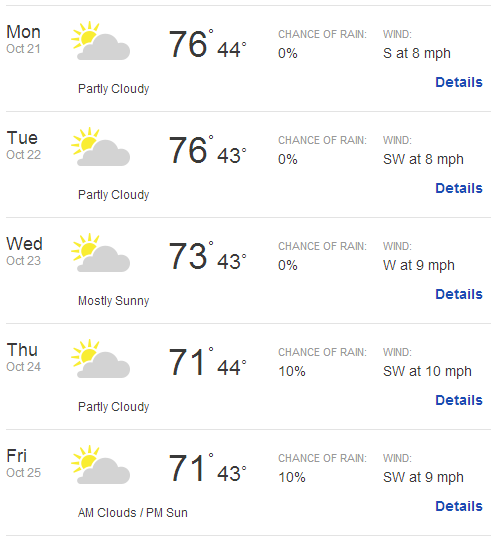 Here is the official five-day forecast for our week at Camp Caritas! Jealous? Jealous enough to take the teacher’s place? Not that we weren’t already excited about Camp Caritas, but after our visit with our site director Alexa yesterday I think we’re all REALLY excited about next week (yes, teacher included). One of the most important ideas that Alexa shared with us yesterday was this: students should come to Caritas with an open mind, because you get out of it what you put into it. Caritas is an amazing experience, but it can be even more amazing if you are willing to try new things and make new friends. Another important idea that she shared with the kids is that everything we do at camp has a deeper meaning that will have students thinking about who they are as individuals and how they fit into their community. I loved it when she told them, “You are much more powerful than you could ever imagine!” So very true. While I have several snarky comments running through my brain about that last instruction, I have to tell you it was the best part of my day! No question. You see, Caritas doesn’t just bring the kids closer together. It brings the entire seventh grade community closer together. Teacher included. It’s hard to believe, but ten days from today we’ll be leaving for Camp Caritas. 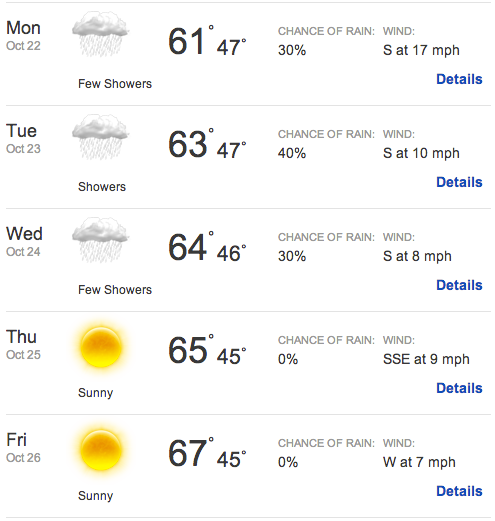 I know it’s a little early to be looking at the weather for that week, but I just couldn’t help myself. Let’s hope that 70° and sunny will be an accurate forecast for the entire week! But whatever the weather happens to be, we’ll make do. It’s Mother Nature’s game…she always wins. And if it rains, we’ll get wet. And the kids will have even more fun playing gaga ball! 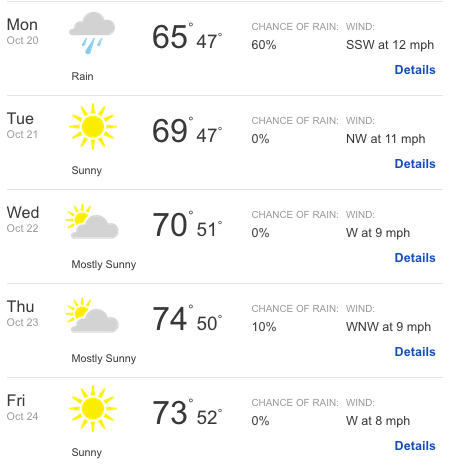 If you’d like to check the weather in Occidental to see what your seventh grader has to look forward to, you can find it here: 10-Day Weather Forecast for Occidental. While I’m away at camp each year, I try to keep those left off the bus (oh, you lucky souls!) apprised of what’s going on while we’re gone. 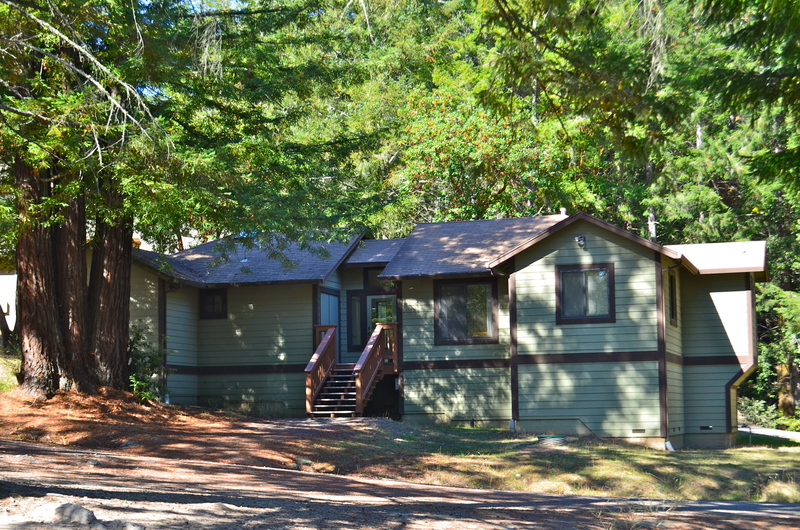 If you would like to follow the adventures of a middle school teacher as she slowly, but surely, loses what’s left of her mind, this is the blog for you: Miss McMillan Goes to Camp.